← Chocolate Caramel Slice. My Way. Pasta with Bolognese. Possibly the most popular home cooked meal in Australia. For such a simple dish it comes in many guises from the good to the bad and the downright ugly. I’m no expert on Bolognese sauce but I know a good one when I taste it. It must be rich, meaty and delicious and coat the pasta beautifully. Last night for dinner we had casarecce pasta with a classic Bolognese. I served it with little side dishes of pesto and fresh ricotta. Southern Italian style. Before arriving in Australia in the early 1950s, my mother lived in Pescara in the Abruzzi region of Italy. She was and still is a wonderful cook. I grew up eating authentic Italian food long before it was fashionable. I learnt to cook almost by osmosis, helping out in the kitchen as the evening meal was prepared each day. What’s the secret behind a great Bolognese? Besides using the absolute freshest ingredients you can find and an obligatory long, slow simmer of the sauce, it’s all about the careful preparation of the soffritto. For those of you who are scratching your heads, soffritto is the flavour base of every good Bolognese sauce. It’s simply the mixture of finely diced onion, celery, carrot, garlic and herbs that is the starting point of the sauce. Sautéed in olive oil until soft with just a hint of caramelisation, a good soffritto imparts incredible flavour to the minced meat, tomato and stock once they are added to the pot. Take care of the soffritto and you will be rewarded with a delicious sauce. I like to cook a large batch of sauce in a heavy Le Creuset cast iron pot which can easily be transferred to the oven after the sautéing of the soffritto and the browning of the meat. Don’t be put off by the two hours of slow cooking required by this recipe. Once it’s in the oven the dish looks after itself, and to be honest there’s only about half an hour of actual preparation time. The quantities provided in the recipe make enough sauce for up to ten serves. Freeze any leftovers for another wonderful meal. HEAT olive oil in a large pot and add finely diced onions, celery and carrots with a generous pinch of salt. Sauté on medium heat until vegetables become transparent, about 15 minutes. ADD chopped parsley, mint and chilli, fresh bay leaves and whole cloves of garlic. Sauté for a further 5 minutes. ADD the minced meat to the soffritto. Increase heat to high and stir with a wooden spoon to break the meat into smaller chunks. Continue to stir for a further 15 minutes or so until meat is well browned. ADD the tomato paste and sugar. Cook, over low heat for about 3 minutes stirring often. ADD crushed tomatoes, water or stock, salt and ground pepper. Bring to the boil. 160 C oven. The sauce will thicken and reduce. Add a little hot water if it seems the sauce is drying out. ONCE the sauce is cooked the garlic cloves will be very soft. Mash them with a fork against the side of the pot and stir into the sauce. Remove bay leaves just before serving. 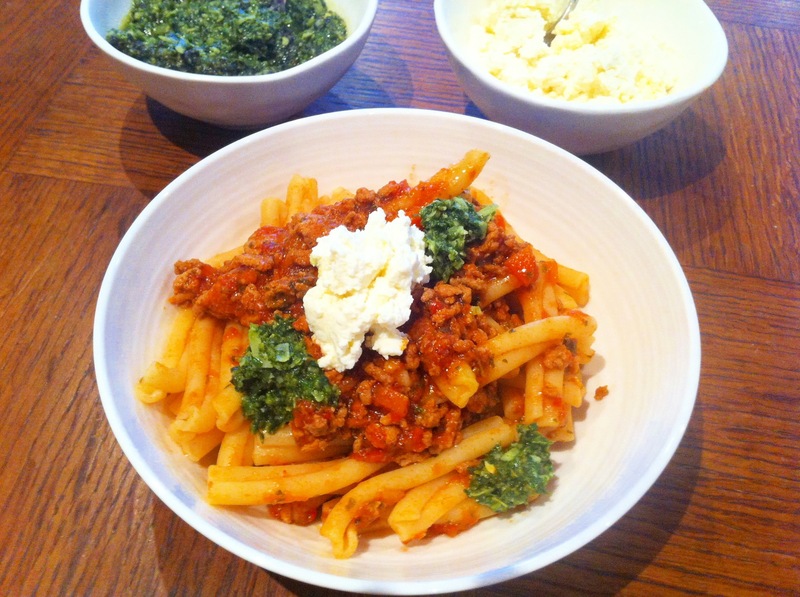 This entry was posted in Beef, Pasta, Pork, What I Love to Cook and tagged Bolognese, Chilli, Dinner, Food, Herbs, Italian, Pasta, Pesto, Recipe, Ricotta, Soffritto, Tomato. Bookmark the permalink. 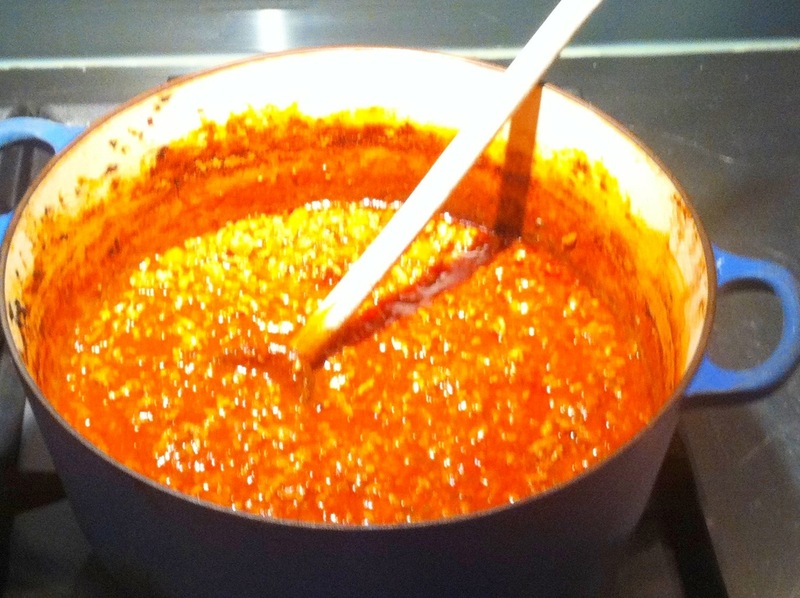 3 Responses to The Secret Behind a Great Bolognese. It’s All About the Soffritto.